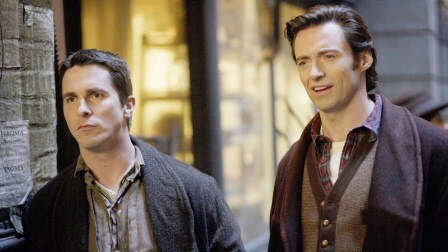 The Prestige is the kind of movie that I have a love hate relationship with. I love the story premise, is brilliant, is engaging, it keeps you guessing and you are thrown into an unexpected twist. I hate it because, well, is a depressing story about two rival magicians and both of them didn't end well. It left a sour taste in my mouth. 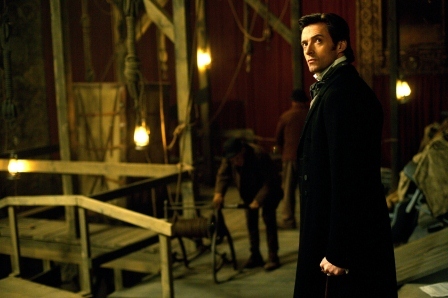 It started off with Borden (Christian Bale) charged with the murder of Angier (Hugh Jackman) when Borden went backstage during one of Angier performance. He was caught with first degree murder of drowning Angier in the tank. The subsequent story was told in flashbacks of how Angier and Borden were friends and they are the up and coming young magicians. Borden is ambitious and often take unnecessary risk, while Angier is refer to as 'not wanting to get his hand dirty'. They worked together with Angier's wife, Julia and Cutter, the mastermind behind most of their tricks. During one of their usual performance, Julia didn't manage to escape from the tied knot and was drown. Angier blamed Borden for switching the knot and causing the death of his wife. Since then they became bitter enemies. 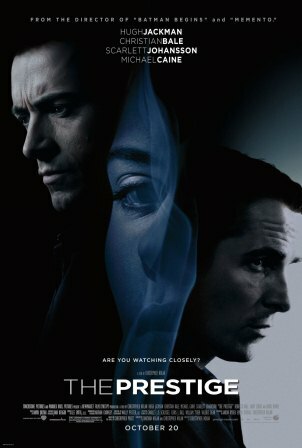 They tried to sabotage and uncover each other secrets and will stop at nothing to ruin each other lives. I find their obsession towards magic is beyond maniac. To them, magic is their life and more important than anything else in the world. Initially when Julia died, I sympathize with Angier and understand his needs for revenge. But as time goes, he became more obsessed with finding out Borden's secrets to 'The Transporter Man' that he willing to give up anything, including pushing away someone who might love him. Borden on the other hand is not someone I pitied either. I don't understand why he changed the knot that killed Julia. Did he just did it purely out of his curiosity or his risk taking attitude? He can't keep himself from sabotaging Angier's performance and tried to ruin his career. What I like most is the unexpected twist during the end. Their secrets are reveal and both party made the ultimate sacrifice. The ending is all kind of depressing for me, but I kind of see it coming. Two villains obsessed with magic and each other. I guess this is how it should have ended for them. Did people actually willing to sacrifice anything for glory? I guess they do. The secret that Angier dying to find out is in regards to Borden's Transporter Man. He is able to transport himself from one location to another. Cutter plainly told Angier that Borden used a double. But Angier refused to believe. This lead to him seeking out Tesla to make him a machine that capable to duplicate himself. During every performance, Angier commit suicide by drowning himself in the tank and then his duplicate will appear at the other end of the stage to receive his applause. I find this absolutely creepy. He is beyond crazy. One night when Borden went backstage looking for Angier's secret, he found Angier drowning and unable to save him. Borden found himself charged with murder and sentence to death. Meanwhile, Fallon, who is Borden's assistant, went to confront Angier, and reveal that he is actually Borden's twin brother. So the secret to Borden's Transporter Man is indeed using a body double. Angier ended up being killed by Fallon.